Let's get real. I am so jealous of my mom and her lemon situation. Right about now, she probably has more lemons than she knows what to do with and freezing the juice of the rest. When we moved to BC, I noticed the obvious price changes when it came to fresh food. While we have the best salmon sashimi in all of North America, things like avocados and raspberries come at a pretty penny. The first time I went to the Farmer's Market last summer I was giddy for an assortment of stone fruit (you can smell the nectarines a mile away in Sacramento), but there were none. Winter isn't really know for its lush and juicy fruits, but I used to at least be able to count on Winter Citrus to pull me out of a chilly slump. I found the most beautiful Satsumas a couple weeks, but what I needed to help lift the fog off the gloomy winter day were Meyer lemons. In the past, I've been spoiled rotten with as many Meyer lemons I could get my hands on from my parents' backyard. Once I hunted them down, nothing made me yearn more for the convenience of home than that steep price tag. It's funny how we can be pedaling along in our new lives, and something as simple as a lemon can send me right back to my roots and instantly bring appreciation for family, harvest, and California sun. With my recent memory of buckets full of lemons at my parents' house from when we were home at Christmas, you can bet that I still brought a bundle of lemons home with me. I was so tempted to bring a sack back with us from Cali, but getting busted for lemon-smuggling across the border was not high on my to-do list. So I bought my own bag of little gems (not knowing how long they will be in season up here), and vowed to make a spectacular lemony dessert and and not waste even a single slice. If you don't know about the Meyer lemon, then you must learn now. It is a cross between a regular lemon and a mandarin. They usually have smoother, thinner skin than a regular lemon- leaving them super juicy and flavorful. Meyer lemons are indeed sweeter and less acidic (even a bit floral) than regular lemons. If you want to make the most glorious of all lemonades, use Meyer lemons. Or in a cocktail, like a homemade Whiskey Sour - yum! Of course, if you can't find them in your neighborhood, you can definitely still use regular lemons. The consistency of the juice and recipe won't change, it's just all about the flavor- like subbing limes for Key Limes. 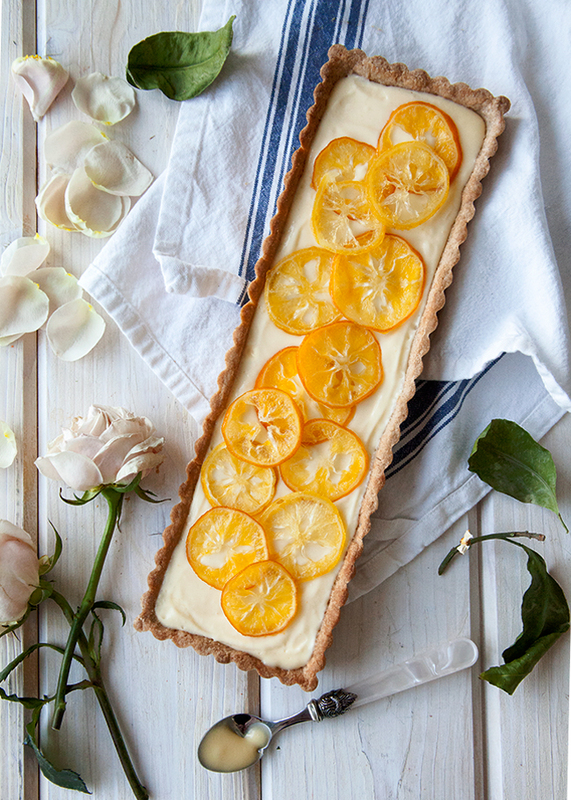 So about this Meyer Lemon Cream White Chocolate Tart. It's the creamiest, tart yet sweet, concoction I've created in a while. I'm sure I'm not the only one who's a bit burnt out from all the gingerbread, pumpkin, and peppermint lately, so this citrus dish is refreshingly delightful. A bit of cinnamon and nutmeg give the sweet dough a little something extra- aside from being buttery and delicious (Confession: I'm a crust lover). The Meyer lemon cream is silkier than a curd and pairs beautifully with the white chocolate whipped cream. Going back to my vow not to waste any of the Meyer lemons, I topped off the tart with some simple candied lemon slices. Seriously, this must be what sunshine tastes like. Cut butter into tablespoon-sized pieces and let come to room temperature. Whisk together the sugar and eggs in medium heat-safe mixing bowl or double boiler pan. Stir in the lemon juice. Place over a medium saucepan of water to create a double-boiler. Heat on medium. Whisking continuously,cook the lemon mixture until it reaches 180 degrees F. Be sure to keep stirring to prevent the eggs from scrambling. Meanwhile, fill a measuring cup or bowl with ice cold water. Add in gelatin sheet and allow to bloom (about 5-8 minutes). Once lemon mixture thickens and reaches 180 degrees, remove from heat. Strain into a medium bowl. Squeeze out water from the gelatin sheet and whisk into the hot lemon cream. If you feel that the lemon cream may not be warm enough any longer, temper the gelatin with about 1/3 of the cream first, then add into the bowl. Let cool about 5-8 minutes or so and transfer cream into a food processor or blender. Adding the butter a few pieces at a time, blend the mixture on high. Continue adding in the butter and mix until light and airy. Transfer cream to a medium container. Press a piece of plastic wrap to the surface of the cream, and let thicken in the refrigerator for about 4 hours, or over night. When ready to assemble, give the cream a quick stir and spoon into the tart shell. Return to the refrigerator until just before serving. For the White Chocolate Whipped Cream, place white chocolate and 2 tablespoons whipping cream in a small saucepan. Gently heat until chocolate starts to melt. Remove from heat and stir until combined. Let cool. In a separate container, whisk together the remaining cream with the vanilla and sugar until medium-stiff peaks. Mix together about 1/3 of the whipped cream with the cooled, melted white chocolate. Gently fold in white chocolate mixture to the remaining cream. When ready to serve, top slices of lemon tart with whipped cream and candied lemon slices. Place dry ingredients in a medium bow. Mix to combine. Cut in the butter with a pastry cutter, or rubbing between fingers, until it resembles a corse meal. Gently beat the egg and add into the mixture. Stir with a fork until the dough starts to come together, but still slightly dry. Turn out dough and quickly knead together any of the dry bits. Butter or oil your tart pan. Gently press the dough into the pan and up the sides. Pop into the freezer for about 15 minutes. Oil or butter the non-shiney side of of a piece of foil. Place in the bottom of the tart and add in pie weights or dry beans. Bake covered for about 25 minutes. Removed from oven and take off foil/weights. Slice lemon as thinly as possible. Combine water and sugar in a medium saucepan. Gently stir to combine. Remove from heat and carefully place lemon slices on parchment to dry. Let dry for a few hours, then flip. Continue to dry out overnight. What recipes have you been making this winter? 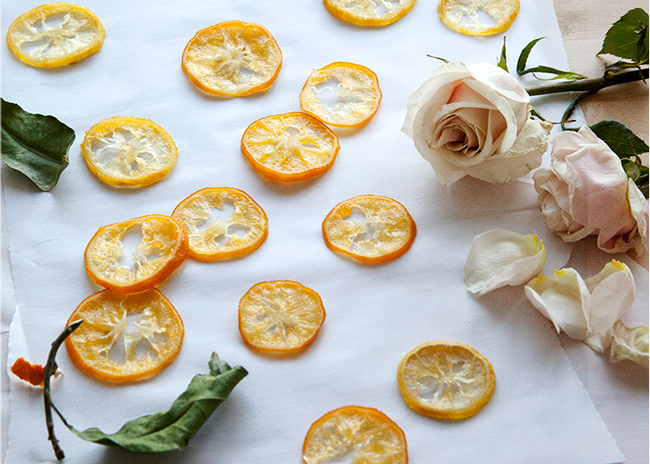 Anyone else making their own sunshine with beautiful winter citrus?